Mount Wolverine can be seen between the trees. 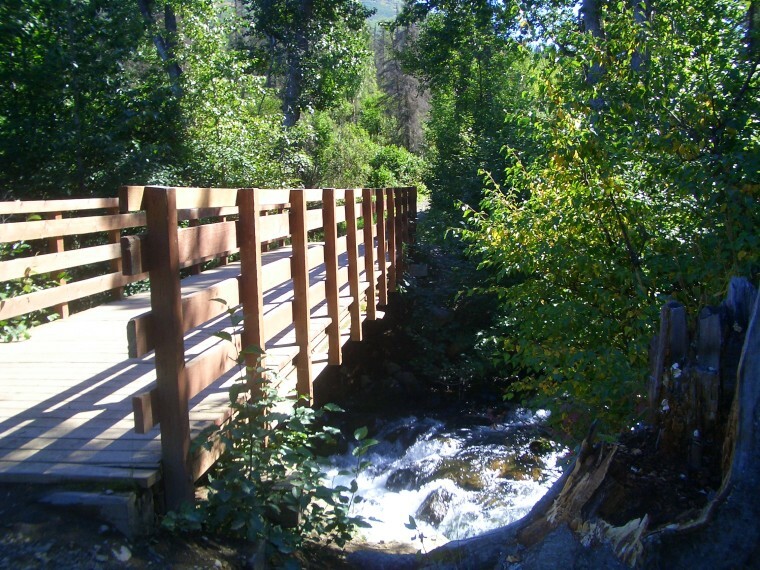 This bridge crosses Campell Creek a short distance from the trailhead. The large cairn (aka rock pile) located on the first ridge. 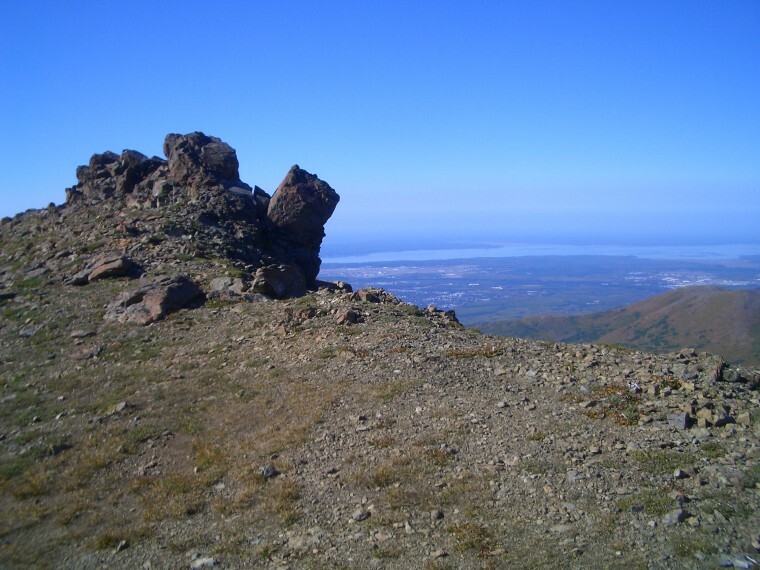 Much of trail has terrific views of Anchorage. Once the ridge is reached, the last section involves following it up and to the right. A great view from the top. From here you can see Williwaw Lakes, Mount Williwaw, the Ramp, and Hidden Peak. 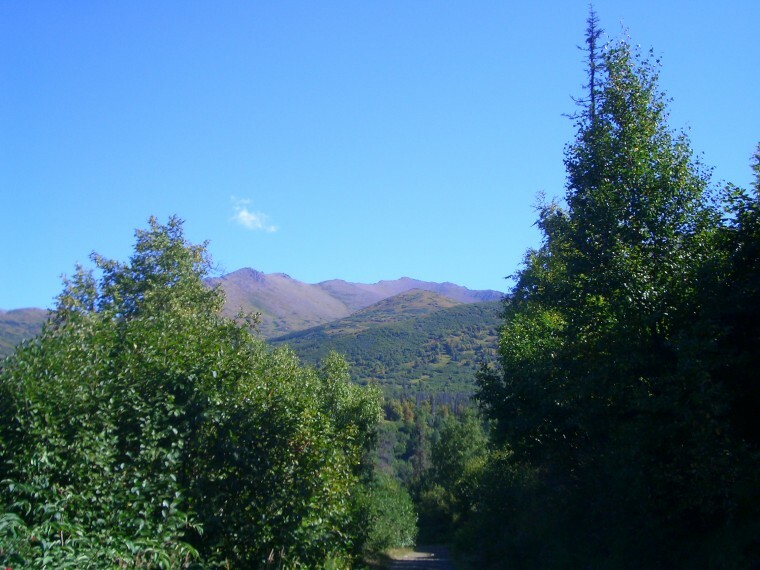 Wolverine Peak is one of the prominent chugach peaks just outside of Anchorage. Upon starting, take a left at the T (the right path leads to Powerline Pass). Follow the trail around the hillside until reaching a wooden bridge which crosses a small creak. 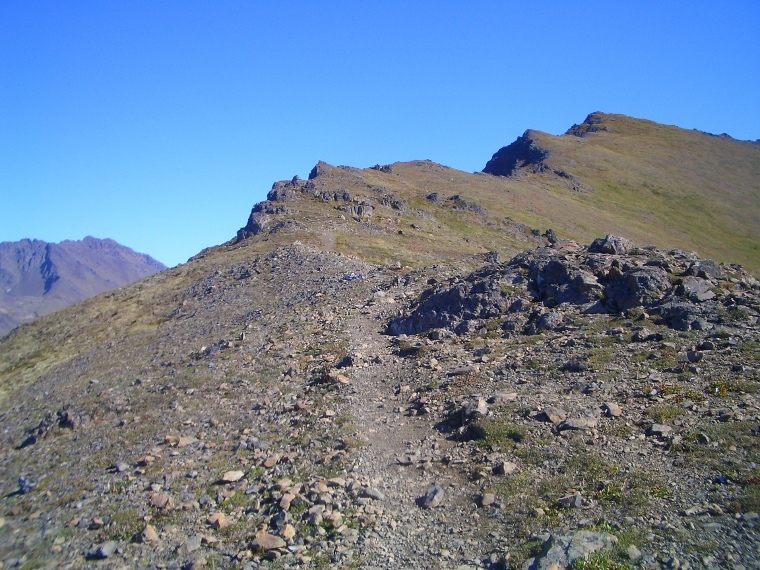 There are several tangent trails which lead to other destinations along the way; just stay on the same trail until reaching a sign for Wolverine Peak on the right (heading strait will lead to Near Point from here). The trail then makes it's way out of the surrounding forest. 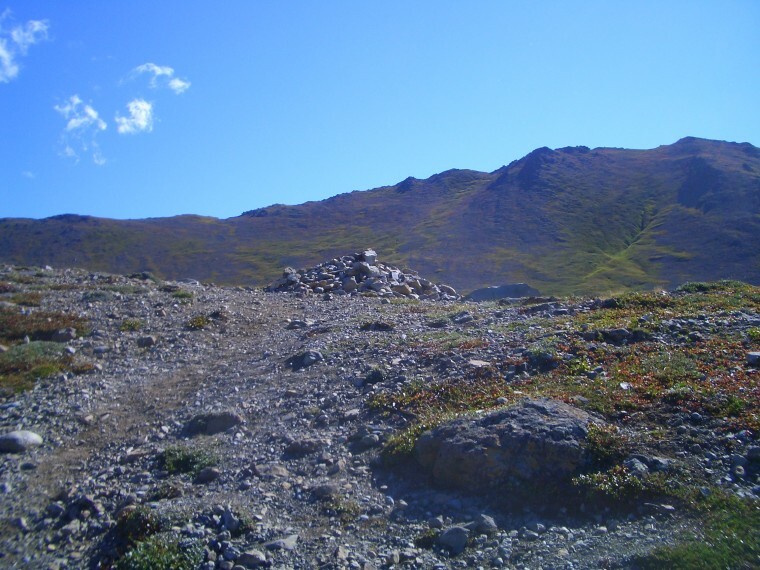 A ridge will be reached after a long trek uphill, marked by a large pile of rocks. From here the trail follows this ridge up and to the left until it reaches yet another ridge just below the peak. 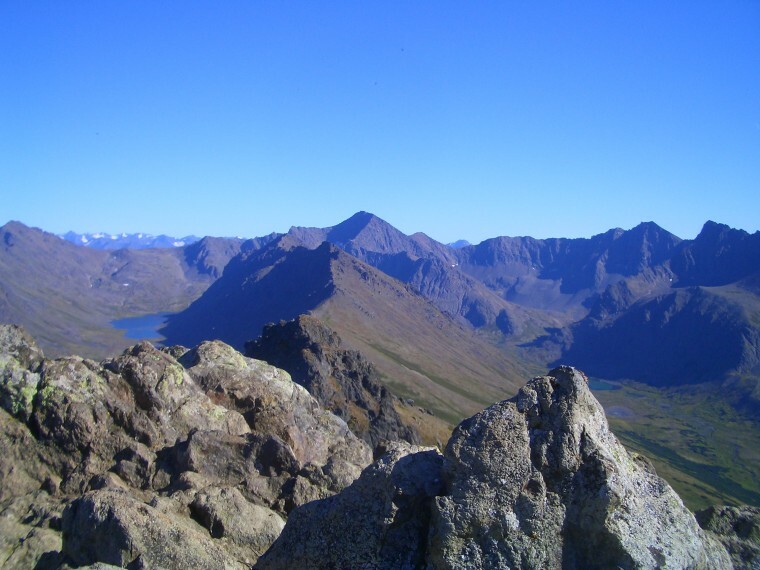 Upon reaching the top the views are terrific, with several lakes and nearby mountains. A strenuous day hike with a good deal of elevation gain. Several parts of the trail head strait uphill. Bring plenty of water. Head towards South Anchorage on the New Seward Highway. Take the O'malley exit and head towards the mountains. Follow O'malley for a few miles and turn right onto Hillside Drive. Turn onto Upper Huffman on your left shortly afterwards. This road T's-off; take the left turn onto Prospect Drive, and follow it for about a mile until the Prospect Heights parking area is reached, where the trail begins. The parking lot requires a $5.00 daily parking fee or a seasonal parking pass.